If you are serious about your site and you want to make sure that your visitors can enjoy it without hiccups, you will have to constantly work on it. There are quite many things that can slow down your site, but there are also a lot of quick and easy ways of speeding up your site. But before you can start working on a better and faster website, you should test robust performance. There are different online tests which will let you know how good or how bad your site really is. Those tests can help you find out weak points, they will let you know how long does it take for a website to load from a specific location, you will get to know if there are security issues to be found, and much, much more. PageSpeed Insights is a simple, yet very powerful online tool from Google which allows you to test the performance of your website quickly. Once you enter the URL you wish to test, Google will run two different analyses on it – one will check the overall loading speed of the site, while the other one will measure just the loading time of the above-the-fold content. The test is network-independent, and it will let you know the score of your site. Any site can get a maximum of 100 points, and your goal is to get any score above 85 which would mean that your site performs very well. PageSpeed will show you results both for desktop and mobile version of a website, and it will display suggestions for improvements. Another performance test from Google is even simpler. By entering a URL, you will get to test if a website is mobile-friendly. 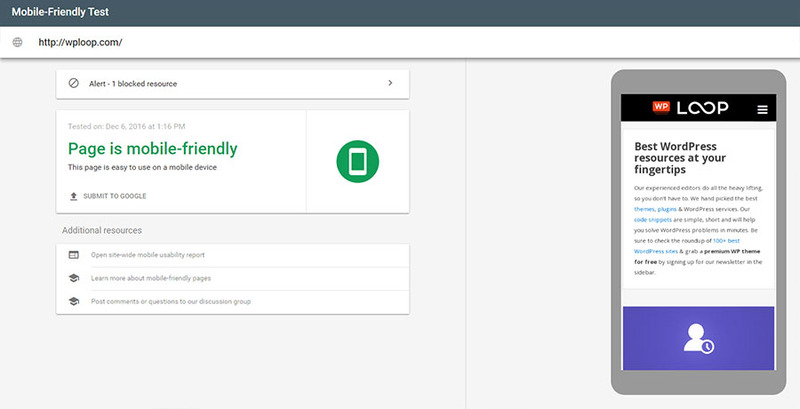 Quickly after testing a site, Google will tell you if your site is mobile-friendly and will show you suggestions for improvements. 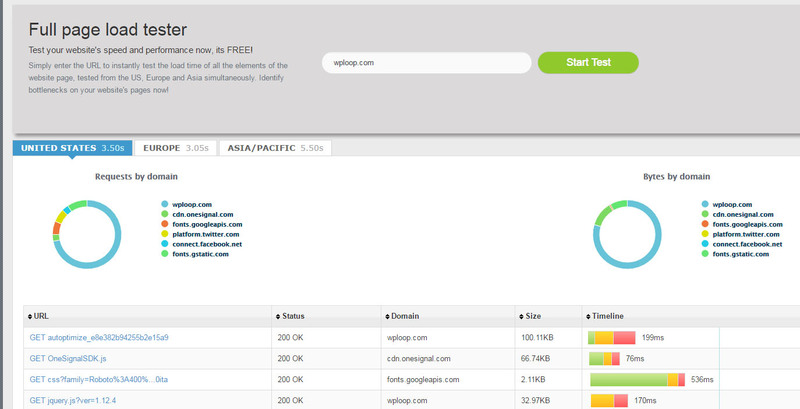 Although very simple, we still suggest that you run the test and see the info about your site. 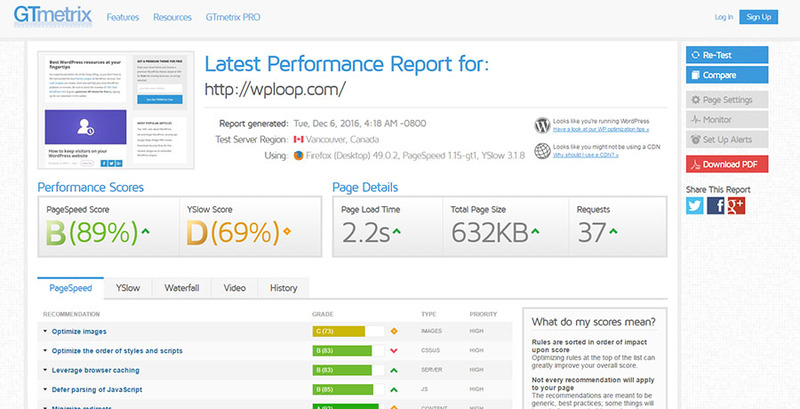 This robust online test will let you know all the details about your site’s performance. Once you enter the URL you want to test, GTmetrix will scan your site and let you know the relevant info about the speed. GTmetrix will let you know about Google PageSpeed results and Yahoo! YSlow rulesets. You’ll get to see page loading times, page size and the number of request per page. The test will show you details about your site and also recommend repairs which might speed up the website. It will also show you a waterfall breakdown of your site and the report history. If you choose to upgrade the free test, you will get dozens of extra features which will let you analyize the performance of your website in very details. At Think With Google, you will have a chance to test how well your site performs both on the desktop computers and mobile phones. After you enter the URL, the site will show you a simple score described with a single sentence. To see more about the test, you can click on a link found below the score. There, you will see which tests were passed, which ones you should consider fixing, and there will be problems painted in red which you will have to fix if you want to have a fully-functional site. Although the bright-yellow background on this site might hurt your retina, don’t get repelled because this online test will let you know some important details about the performance of your website. To begin the test, you should enter a URL and choose one of the four server locations. After a quick inspection, Pingdom test tool will show you a summary where you can see the page’s Google PageSpeed performance grade, load time, page size, the number of requests, and the percentage which shows how good your site is opposite to the other sites. If you continue on scrolling, you will get to see performance insights, response codes, and different insights about your content, domain and file requests. If you are serious about testing your site, this is a must-have online tool. Whether you want a simple test or a sophisticated analysis of your site, Web Page Test will help you a lot. It will allow you to choose one of the dozens of locations around the world, and you get to pick a browser as well as a connection speed for the test. By selecting all the options, Web Page Test allows you to test the performance of your website at real consumer speeds and conditions. You can also choose up to three websites and run a visual comparison test which looks awesome. If you want to go into more detailed tests, you can select to perform up to nine tests. For advanced users, there are options like multi-step transactions, video capture, content blocking and others. Once the tests are completed, you will get grades, charts, and suggestions on how to improve your website’s speed. Currently, Dotcom offers 24 locations to test your website from. After a quick insertion of URL and solving the captcha, you will get a chance to choose one of the many modern (or old) browsers. By doing so, you can see how well does your site behave on a specific browser from a particular location. Since the test goes through all the locations, you will have to wait for some time before all the tests are completed. After that, it will show you average loading times, page sizes and the number of errors from any of the tested locations. The test will also let you see a waterfall chart as well as some other charts to visually represent the speed of your site. Yslow analyzes website performance based on Yahoo! rules. There are 34 rules that this test will analyze and it will let you know how does your website behave on the Internet. Unlike the other tests mentioned in this article, Yslow will require you to install a browser add-on or to install the extension differently. 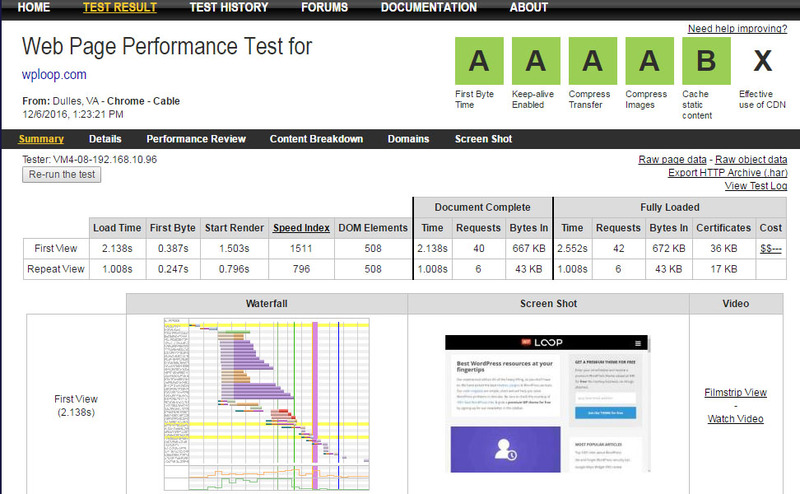 The test will let you see the grades, analyze components and see detailed statistics about your site. Monitis is a very simple test which is designed to show quick results. It will check your website from three different locations; one in the United States, one in Europe and one in Asia/Pacific. You will get to see a simple chart and a table with all the links and their speeds. We loved the permalink feature which allows you to share test results with anyone via email, social media or direct message. After hitting the test button, Uptrends will show you color-coded results in the waterfall or by domain groups. This will allow you to quickly identify the problematic segments of your site so that you can quickly fix them. Uptrends will let you choose among dozens of test locations so you can make sure that your site is loading quickly from any part of the world. 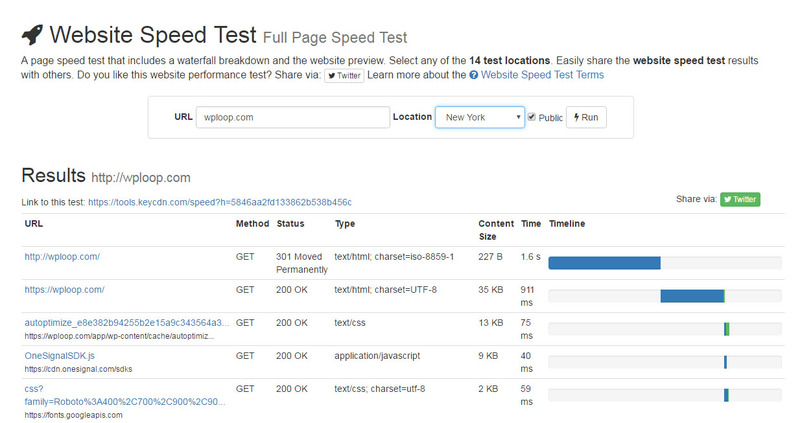 If you liked this speed test, you will be interested in other Uptrends online tools. Don’t forget to check uptime, traceroute, DNS report and your IP address. 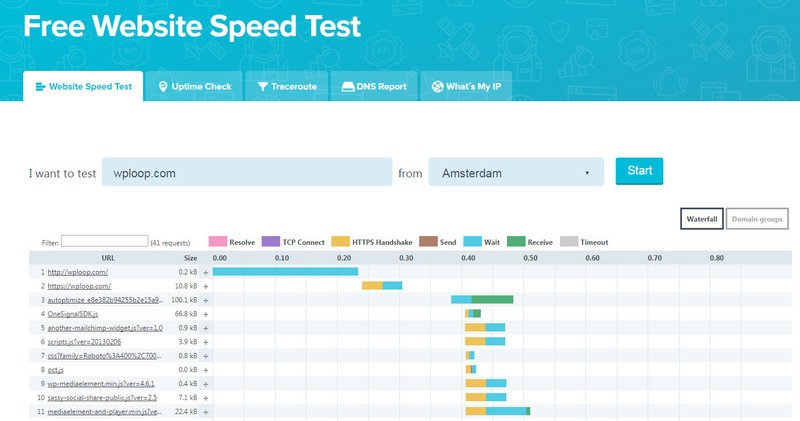 Although very simple, Website Speed Test by Keycdn will let you know all the basics about your site speed. After testing the site from any of the 14 test locations, you can expect a waterfall breakdown and the screenshot of your site. Just like Monitis, this test gives you a unique link to the test so that you can easily share it. In the end, we have to include our own WordPress Security Scanner. While all the other tools mentioned in this article will test the speed of your site, this one will scan a WordPress site for security issues. The test will let you know about several details about your WordPress site so that you can quickly identify potential threats to which may affect the overall performance as well. It doesn’t really matter how quick loading times are if your site is at risk from hackers, right? In order to start working on the site improvement, you don’t have to do all the tests from this article. We suggest that you run some of them to get a clearer picture of how your website behaves on the Internet for particular kinds of users. Since these are just tests, don’t take everything for granted. Results often depend on the speed of your Internet connection and many other aspects. Before the final verdict, we suggest that you test your website from different sources and that you do the tests several days in a row. Just for example, one of the tests we used for this article gave us bad results yesterday, but after we repeated it today, the results couldn’t be better. We hope that the tests mentioned in this article will help you. Which one do you like the best?